In the spirit of The Blind Side comes a deeply moving memoir about the unexpected bonds that wouldtransform three lives. I can easily say this is one of the best books I’ve read this year. From the very first page, the story read like fiction, drawing me into the lives of Dartanyon Crockett and Leroy Sutton as though I was standing right beside them. 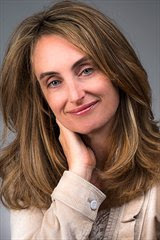 Lisa Fenn evokes raw emotion, vivid images and makes the reader question– all of which mark the work of a highly skilled journalist. As a memoirist, Fenn proves equally as skilled. She’s willing to look at her own prejudices and shortcomings and reveals them with honesty and vulnerability, making her relatable and tangible. She skillfully explores the fallibility of human emotion and openly grapples with her own perception of the world. 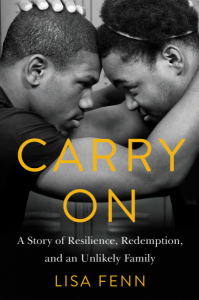 Carry On isn’t just a story of “Resilience, Redemption and an Unlikely Family, as the tagline on the cover of the book states. It is also a story of race, poverty, prejudice and privilege, but it is told in a way that is objective enough to entice even the most difficult of readers and intrigue the most discerning of people. Fenn depicts the truth of race and poverty without judgment and without prejudice while simultaneously checking her own privilege and preconceived understanding of how the world operates. This is the definition of incredible nonfiction, and I would recommend this book to anyone remotely interested in the lives of those who love a good story about the underdog. nning feature producer with ESPN for thirteen years, LISA FENN interviewed every big name in sports. Today she is a sought-after public presenter, speaking on leadership, poverty, and transracial adoption, in addition to her Christian faith and its relevance in both her media career and her daily life. Lisa received her BA in communications from Cornell University. Her work has been featured on ESPN,Good Morning America, and World News Tonight. She continues to produce sports stories and write about the redemptive power of love. Lisa resides in Boston with her husband and two young children. I feel like this is a book everyone should read in order be reminded of the impact one person really can have on another.